You know you are guilty. You shot a furtive glance, a surreptitious gaze into your neighbor’s window. Did you catch a glimpse of the kitchen table, a man wearing pajamas, the television glowing in the corner, or maybe, just maybe, a painting hanging above the sofa? It’s time to come out of the shadows and stare openly in the bright light of day. The Heart on My Sleeve project is an invitation to do just that. It offers a typically private experience, the viewing of a painting made expressly for a home, to the public. Heart on My Sleeve is an outsized welcome mat that beckons each passerby to look and to linger. 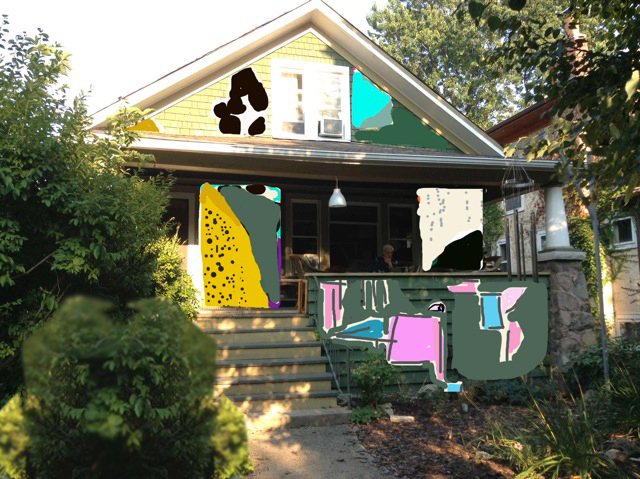 This entry was posted in Openings and Events and tagged art, Chicago, Leslie Baum. Bookmark the permalink.